Delicious. Satellite sandwiches? What a good idea. I'll confess, that's pretty ingenious. I'm kind of impressed that they're staying up, I would think they or parts of them would slide down. 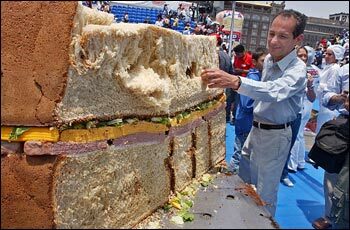 Would you really want a sandwich for a table? I'm pretty sure having a rainbow table makes you gay/a leprechaun. What if you're a dinosaur, driving on a rainbow?